We have several acres of vines, including Le Crescent, Brianna & Marquette. Some say the Marquette will revolutionize the northern, red wine grape industry with its high sugar and low acid levels, not to mention its colors and aromas. 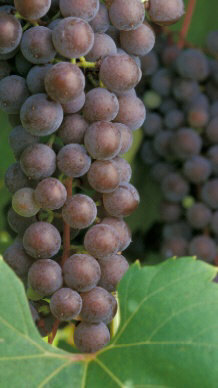 The LaCrescent is an excellent white wine grape, with the Edelweiss being a near flawless blending grape. In 2008 we expanded our Marquette acreage. If you are a commercial winery, please contact us ASAP for contractual consideration. We have been approached by two wineries already, but have not committed our production. Even if you are only interested in home wine making, please let us know. We will work with you. Don't forget, we grow beer hops too.